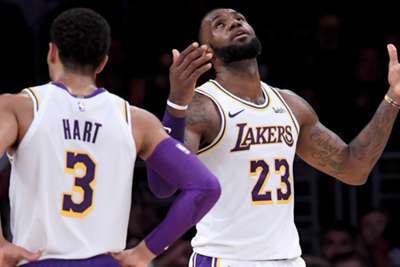 LeBron James urged his Los Angeles Lakers team-mates to ignore "outside noise" after they fell to a sixth defeat of the season against the Toronto Raptors on Sunday. The Lakers suffered a 121-107 home loss, despite their opponents being without injured star man Kawhi Leonard. James had 18 points and six assists, but saw his side end the first quarter down 42-17, a 25-point deficit which goes down as the team's worst opening frame in the shot-clock era (since 1954-55), per ESPN. The defeat, which sees the Lakers drop to 4-6, came after president Magic Johnson insisted coach Luke Walton's position was safe after a week of speculation at the franchise, who are under pressure for results after landing James from the Cleveland Cavaliers. "They have been playing like they are the best team in the Eastern Conference so far," James said, per ESPN, of Toronto (9-1), who were led by 34 points from Serge Ibaka. "They just came out and hit us right in the mouth. "It's going to be very, very hard to make a game out of that when you're trying to expend so much energy trying to get back in it. "You always just stay even keel when you come in for games or you come in for practices and you're going for film sessions, you get better then. But you never let the outside noise get to you and if you do that, that can cause you problems. "For me and what I've experienced in this league, I've tried to stay even keeled. Just as bad as you can play for a month you're going to round out a great month or two. You don't look too much into it." On the back of 24 points from Kyle Kuzma, the Lakers narrowed Toronto's advantage after the nightmare start. James added: "Second, third and fourth [quarter] we played Lakers basketball. First quarter we just came out sluggish and looked like [we were on] a back-to-back like we got in late. And they put it on us. "There are a lot of things we could have done better. At the point of attack we allowed them to get where they wanted to go however they wanted to go to start the game. And they got into a comfort zone. When you get into a comfort zone early like that, shots are going to fall." The Lakers are back in action at home against the Minnesota Timberwolves on Wednesday.